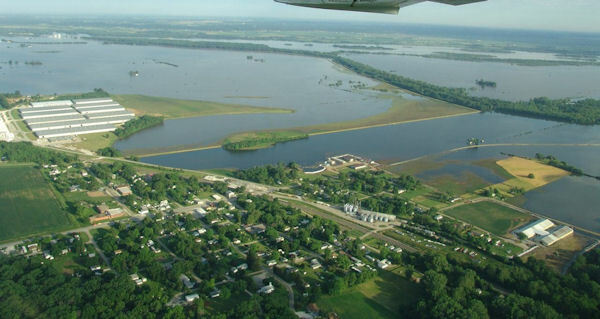 Pictured are three of many aerial shots taken Saturday after Mel Lynch of Monmouth took Publisher Dessa Rodeffer up in his airplane to witness first hand the vast flooding area of Henderson and Hancock County. It is hard to believe the mighty Mississippi River can spill over and cover such a vast amount of land. Dessa' granddaughter Ali Postle of Stronghurst, turned 14 Saturday and accompanied her on the flight. She will always remember her 14th birthday. Mr. Lynch is a mechanic for Jet Air and also gives flight instruction in the Monmouth-Galesburg area. Looking northwest over Gladstone and Twomeys buildings where the Unified Command Center is located.